wooow, has it really been 3 years since the last post?? There was also a couple of weeks of site downtime... sorry about that....my bad, moving hosting just before a vacation aint a good idea... things went south and then I totally forgot since im not too active (unlike most of the team, I deserted a long while ago but I still lurk around and keep the vault running :) but were back, the forums were up the whole time and hopefully someone whos a bit more up to date with the past progress might actually deliver you the 3 year memo/report at some point if i poke them enough to get them out of the caves and into the radiating sunlight! Knowledge is power. Know about the things you try to incorporate. This means research, especially if you're not from the area you're designing, as is most of MR's team. 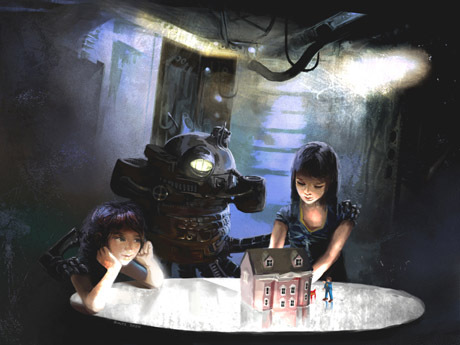 Game writing is very different from writing a novel, where you control the whole of the story, or writing for a P&P game, where you can always improvise as you personally interact with players. What you write in a game is set in stone once it's done. Writing is a creative process. If you want quality, don't force it. Know when enough is enough. Perfection can be what sinks you unless you know when to say 'this works, this is good'. 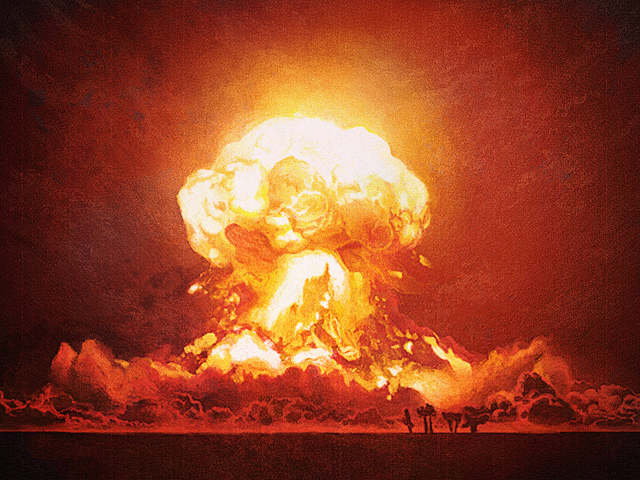 � Have expert-level knowledge of Fallout 1 & 2. If you're reading this, you probably meet this requirement. � Have a high school/university-level grasp of the English language. Our writing team is very small -- enough time will be spent editing for content. Editing for basic grammar is not an option, and (sadly) won't be tolerated. � And that's it. It might not seem like much, but (surprisingly) few applicants are able to meet these requirements. If you're passionate about Fallout 1 & 2, you WILL like this mod, and we want you to be part of it. To apply, visit the forum at http://www.mutantsrising.info/ and post in the recruitment section, or send me (Angry) a personal message. This is just a short update to tell you we�re still alive. A couple of weeks ago we promised a big update with lots of content and good news to share. Unfortunately, delays happen, so we decided to post a short update now and reserve the good stuff for when it�s ready. We were working a lot on area and gameplay designs. As you may know, MR lost most of its documentation in a server fire in 2009, and this lack of specific designs was hampering our progress. As new people joined, we realized the need for detailed design documents, to make sure everyone was making the same game. We have since written several hundred pages of material, and we�re nearly finished. The bulk of the writing took place throughout 2012 and we believe we now have a solid idea of where we are in the development process. Many of our members had to deal with real life issues and this always reflects (usually negatively) on the regularity and pace of production. But even though some content may be delayed compared to our predictions and wishes, we�re still on track and have made good progress, as evidenced by our progress bars. 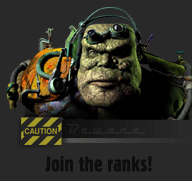 We are still recruiting � presently, we could especially use new mappers and as usual � writers. All we expect from recruits is dedication and regularity, coupled with some expertise in the things they�re going to do, such as knowledge of the Mapper tool and rudimentary level design skills for map builders and good grammar, spelling and style for writers. In return we can only offer the fun of creation, the conviviality of the team, and everlasting fame and glory when the mod is finished ;) To all interested, please drop by our forums and leave a message in the Recruitment section. Our Christmas demo turned out to be a huge success (for a Fallout 2 mod), having received a lot of kind attention from the community and well over 1000 downloads in the past quarter of the year. We also got a lot of praise as a team, for which we are very grateful. But the moment of relishing in our *cough* worldwide celebrity *cough-chuckle* has passed and now we're back in the workshop again. In the first months following the release of the demo, we decided to focus on precising and freezing the design element of the mod. This will not only enable us to better assess the time and resources needed to complete the game, but will also help us make sure every element of the plot comes together and ties in nicely with one another. We have also made significant progress in the art department, mainly thanks to the impressive works of Stampedo who churned out about a dozen ending screens within a week. To provide you with a proper dose of classic Fallout eyecandy, we did a major tidying up of our website's Gallery, removing all the old screenshots that did a very poor job of showcasing the current shape of the project. Note that all of the new screenshots in the gallery have been taken during one continuous playthrough of the mod. 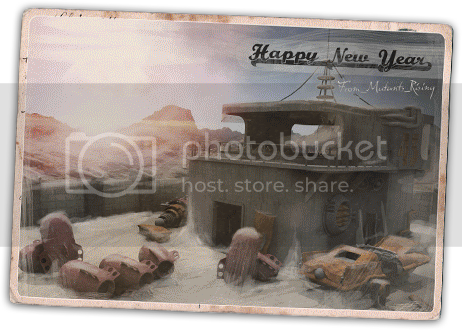 To top it, we have added some cinematic/end-game illustrations and some concept art. We are also happy to introduce our new members: BBmultipass, a scripter known for his involvement with the Fallhope project, and Gaspard whose tasks include proofreading, writing and providing more artworks for the game. We are always looking for recruits and will be very happy to take on hard-working writers, a talking heads 3D artist and an experienced mapper. The patch 1.01 for the 2011 Mutants Rising Demo, correcting all reported errors, is now available. In order to install, download the file from one of the links provided below and unpack it into your MutantsRising folder (regardless of whether you used the installer or manual install). Click "Yes to all" when prompted about overwriting files. The patch will probably break your save games. Also, you need to start a new game for the changes to take effect. * Smart Installer - Download the file on your hard drive and double click on it. When the Installer window appears, choose "Install" and follow the instructions on screen. * Manual Install - If the Installer doesn't work for you for some reason, or if you're already familiar with installing Fallout 2 mods, you can try the Manual Install. Download the ZIP file into your Fallout 2 installation directory and unpack it there. A new folder should appear, named "MutantsRising". Go inside it and read the readme for the remaining installation details. We're anxious to have your opinions, so make sure to check out our forums http://forums.mutantsrising.info and leave comments. Should you find any bugs or have any questions, please post them in their respsctive threads on the forum too. Have a good time with Mutants Rising! The previous progress bar wasn't very accurate and since the shape of the mod changed considerably over the last few months, it has become completely unreliable. That's why we have devised a more precise (and more number-based) method of calculating progress, tracing the major aspects of Fallout modding. It may seem like we're farther away from the finish than we made out to be, but note that the new system counts only things that are final (i.e. finished and frozen design documents, frozen dialogue, finished, tested and working scripts, finished art etc.). These figures are accurate and hopefully, you will see them rise more often, which will give you a better idea of the pace we're progressing at, so please, don't hate us. We'll get to the finish eventually, and it will be worth the wait." Damn, it's Easter, see how the time flies. Well, we're here to say that we're still alive and no, we're not finished yet. Actually, we have made several important decisions for the benefit of the game, but to the detriment of the release date. Most notably, we have restored an entire location that was already slated for the expansion pack, back into the vanilla game. The town was cut back when the team consisted of around 3 active members. Now we have more members and it is imperative that this town is brought back to life. Also, we have decided that despite the third makeover, the initial town of Elko wasn't up to our expectations and have scrapped it completely. Constant updating and adapting have ruined the nature of Elko, so it was easier to start from zero. Elko is now being remade with entirely new maps, new dialogue, new design and new scripts (as well as some shiny new art). We are proud to say that it is much truer to the spirit of Fallout than it has ever been (For the first time ever the whole team is happy with the town and we will NEVER touch it again). Finally, we are working extensively on Las Vegas' design to make it shine in its own MR way, which will be much different from Obsidian's New Vegas' allure. Of other news, we are very happy to share with you our take on the famous �War. War never changes." line. The cutscene was made by our fellow modder, a full-time member of the EC: Paris TC mod, you know him, you love him, Aguirre. Voice over was provided by Brian Sfinas aka Cunningandvalor, who also did voice work on several of our Talking Head NPCs. We also have a new, stunning world map created by .Pixote. the Awesome and some cool ending screens. image gon :( baad imageshack! So... it's almost the end of quarter two and we haven't finished making our precious baby. (shocked?) We could release the game as is, but we understand that the Fallout community has high standards, and we do not wish to disappoint you all. Ardent who is famed for his excellent mod (at least among us modders) joined us earlier in the year and has been systematically ripping apart our work and putting it back together in a shinier form for your pleasure. A different perspective on things has been refreshing, and considering the core team has consisted of a handful of people over the years, it was much needed. Chris Parks, our resident ubber modder unfortunately has a life (plus the problems that go with it), and as much as we would like to chain him up in a basement (fed on fish heads exclusively, of course), we can't do that. We are working very hard to finish the scripting, and in the mean time our artists - Sharae, .Pixote. and Equilerex (who is safely back from the army) have produced some new artwork, most of which we prefer to keep under the blankets to have some surprises for you when the final build is released. Also, our writers, Jinx and Ghouly89, are working on new content for the expansion pack. We have been collaborating as a team to write a dialogue tutorial for FO modders and we hope that you will find this a positive reflection of the mod to come (Read it here). The modding community can expect more tutorials when we release the game and have the time to spend on them. We hope that new tutorials and the assets we will be releasing will encourage more modders to come out of hiding, as we have seen with the latest release of Killap's excellent project. Mutants Rising has been alpha testing for the past month or so, and we are working to release a stable build. We would rather not release a piece of software with disappearing car trunks and random CTDs. Testing has already chewed up and spit out a couple of people. Our sole scriptor and leader has not been well, and has had a few other RL issues, which has unfortunately lead to some delays, as well as other issues i.e. diminished team. We where hoping for a Christmas release, but did not want to set a public release date luckily enough. Hang in there though, as we have all the groundwork for a final release now, apart from a few maps which are being worked on right now. We still do not want to set an official release date as RL is an unpredictable thing, but MR should be in your hands in the first half of 2010. We are now working on the expansion pack for the project and some preliminary progress has been made, but it's completion depends on your opinion of the final release and the ingress of new blood into our team. 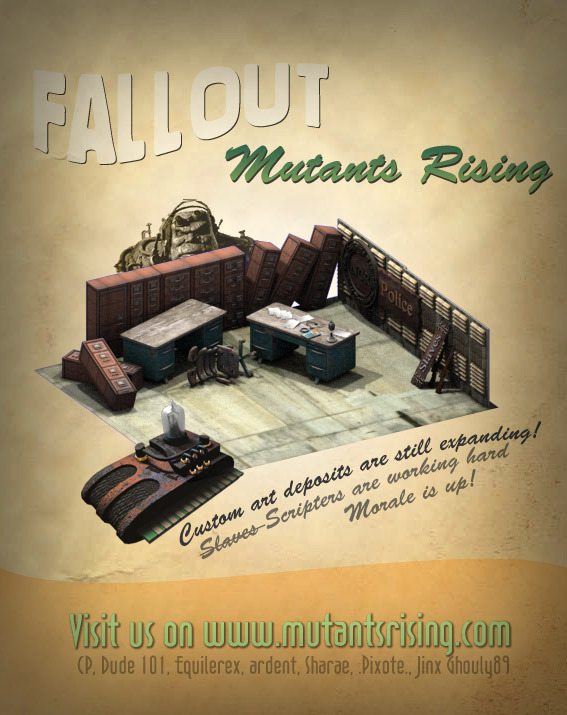 Mutants Rising need you! We are now open to new writers joining our team for this. These will also be appearing on our new ModDB profile if you have trouble with these DL links. We bring you a render of the basement in the final location of MR - Morrows, made by equilerex. It features complete new art for everything including a new one person elevator. After much deliberation and furious playtesting of the mod, we have decided to go ahead with the restoration of ELKO, the initial town in the game. Dude101 and I talked about this almost constantly during the design of the game, but with each passing town, it was forgotten about. As most of you are aware, I joined the mod to save if from being cancelled and effectively resurrected the game. Elko was the ONLY part of the game that had any real work done on it, so I added it straight into the build. Although the reviews of the demo were favourable, there are many bugs in the demo and quests which don't quite gel with one another. Instead of trying to fix this, we have decided to overhaul the town from the start now that we have a better idea of the whole game. So what's happening? We intend to re-write all the major dialogues and streamline the quests somewhat. The cluttered city map will be expanded onto around 5 smaller maps to ease loading times and increase the character of the game. The vault under the city will be removed as this never seemed to "fit" with the idea of a shanty town, built in haste. This is a promising move for the game as a whole and it will allow Dude101 and Aaron some creative freedom with an area that was largely locked from the start. This does mean that we will be delaying the release of the game until these changes are implemented and working. One final note. We had considered releasing another demo to showcase the new elko. Is this something that would be welcomed by the community? The last month or so has seen a flurry of activity on and off the forum. A whole town has been completed, Las Vegas, since our last press release and now we are within sight of the finish line. Only one and a half towns are left to be scripted and then we have a completed build to test. We welcome to the team, HV, an ex FMF member who is working on the scripting of COTC before moving on to other areas of the game. Hopefully his ability will lighten the load on me as we run down the home stretch. - Chris Parks, team leader. The stranger had walked into the sleepy town of Wendover just three days before, mud clinging to his boots and sand caking his lone pistol. His time in the town had been intersting to say the least. Supplies were purchased from a gun shop to the left of the town entrance. stocking up his resources. Even though the store was well stocked, it had a pitiful supply in comparison to what he actually needed. He spent his nights in the brothel mostly, getting to "know" the local ladies. In his short time in Wendover, his name was etched into its history. After leading an attack on the brothel to liberate the prostitutes he was told were trapped there, he brought together the town to fight against the impending mutant attack. The combined efforts of the whole town ensured that most people survived. In the carnage that followed, the evil doings of the Normans was atoned for to an extent. I just hope that nobody else takes their place. How different things could have been if the stranger had not united us. Maybe we would not have survived. I know little else of his business in the town. Some say that he had doings with the airfield guys, but I never knew about it. He left shortly after the mutant attack. Me, I am done for this world. I hope that the next offers me some comfort that this one hasn't. 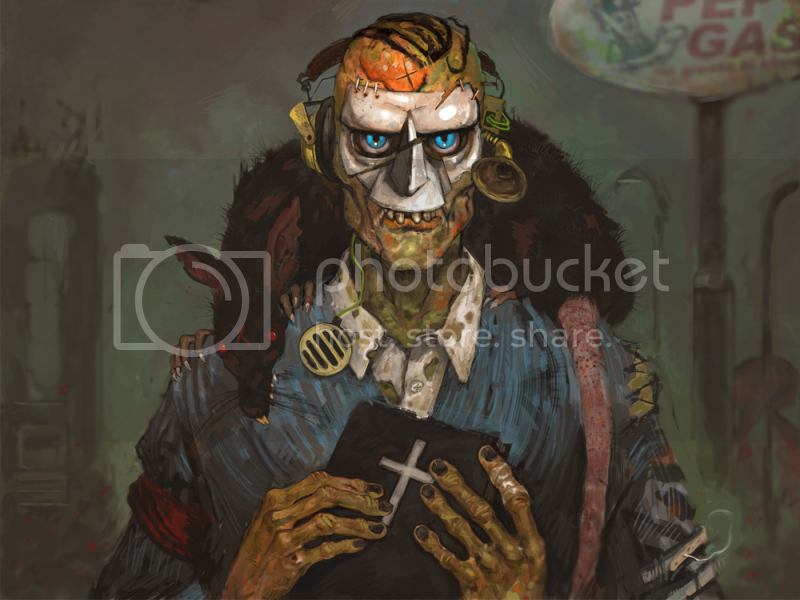 - Account of Rus, doomed survivor of the mutant attack. We're back!! Yes, although we've had a period of enforced exhile, we are back and working hard again. The old server had reached the end of its lifetime and gave up on us. It has taken quite a while to get the new server up and running correctly. Unfortunately, work has slowed somewhat on the project. Each of our main contributers has personal issues to deal with so work on MR has taken a back seat. However, we do want to assure everyone that we are working and have made some more progress. It has been some time since we released any information about the mod, so we thought it was time we brought the public up to date with everything. Let's get the bad news over with first. Due to circumstances beyond our control (server catching fire) we have lost our development forum and some of our key background material. We are currently trying to recover the lost data and forum but this is likely to take some time. We do want to assure everyone that this will not hinder development in the long term and no actual game data from the current version was lost. Secondly, our main (and only!) mapper has had to leave us temporarily to join the army. he has helped tremendously with the mod and has single handedly made maps for at least five towns in short time. We wish him well and eagerly await his return. On the more positive side of things, work has been progressing well on the mod and now only three towns out of 11 need completing. Of these, two have their maps ready and one has a complete set of dialogues ready to be scripted (Oh the joy...) Once these towns are completed, the hard work of tidying up the game and checking for errors will begin. Continuum and equilerex have been working hard making new artwork to shock the community with and we have ensured that each new town has something special to shock you all with. On the scripting side, things have really slowed to a crawl unfortunately. I'm the only scripter and as such everything from scripting to installing new art, maps, sound etc is on my shoulders. I have been very busy at university this year and have pressing family commitments so little time to mod fallout. However, scripting is still infinitely quicker than completing all the dialogues so things will pick up at the end of term. At this hard time, we also extend our sympathy to the late FMF team. It is such a shame to have lost our rival team and to show our appreciation for all the effort they put into fallout, the team has decided to put City on the Coast, a self contained area, into Mutants Rising to ensure all their work has not been in vain. As always, we would welcome any new members to help with the final push on the mod. Anybody interested should contact myself or Dude101. Thanks for listening to me ramble on. Until next time. Keep playing fallout. I realise that many of you have been eagerly anticipating this project and as such I have an apology to make. The website has not been kept up to date as was hoped and we haven't been around NMA for a while either. There has been valid reasons for this but rather than dwell on the past, we are looking to the future. The website will undergo periodic updates to keep everyone informed of what we are doing. The key piece of news this month is the mod progress from the main page. This is not a lie: we are very close to the end of the project. The team has been very active over the summer and have spent countless hours on furthering the project. Only two towns are left to be worked on and all the others are either completed or well under development. The artistic team, consisting of Continuum, Dopefish and Equilerex have completed countless pieces of art and each town (with one exception) now has a loading screen. It has almost reached the point where the writers can't come up with any new artwork for them to make! Public, our new musician, is a one man musical army. He has created, along with help from Emink, new music for almost every town in the game. The atmosphere of Mutants Rising has taken on a personality all of it's own. Animalize, our only full time mapper, has completed maps for no less than four full towns all on his own as well as maps for smaller, less involved areas. Whilst it is true that many of the team are capable mappers, none of us live up to his high standards. Below are a few juicy screenshots and tidbits just to keep you all coming back for more! The above artwork was designed for a disused train station. (surprised?) It plays an integral part in the completion of the game. Above is a brief screenshot of the final area of the game. Continuum has taken it upon his shoulders to make a complete set of new art for this area to ensure Mutants Rising has the lasting effect that a mod of it's size deserves.